VATICAN CITY — The Swiss Guards wave you through St. Anne's Gate, the business entrance into the Holy See. The bustle of tourists fades behind the high wall, replaced by the burbling of a fountain as your guide, dapper Belgian publisher Paul Van den Heuvel, leads you into a hidden courtyard behind the papal residence. On a far wall are metal doors carved with scenes celebrating Egyptian papyrus, medieval manuscripts and monks' scrolls. Through the doors, a plaque on the wall greets visitors to the VATICAVM TABVLARVM, Latin for Vatican records office. "Welcome to the Vatican Secret Archives," says archivist Enrico Flaiani, head of conservators at the venerable institution. "I will be showing you many things," he adds with a quiet smile. Founded in the 1600s by Pope Paul V, sacked by Napoleon, returned, moved and open only to scholars since the 1880s, the Vatican Secret Archives, the Archivum Secretum Apostolicum Vaticanum, serve as repository for the diplomatic records of pontiffs. Records stretch back to at least the 800s; the parchment Liber Diurnus, a circa-eighth-century codex containing legal language for consecrating monasteries and addressing dignitaries, is the oldest record in the archive. The most intriguing of its records are the subject of this year's The Vatican Secret Archives, which was published by Van den Huevel's VdH books and is the reason for the tour. "The book presents some of the most fascinating of the documents in the archives," says Van den Heuvel. The volume holds lavish photos of the halls and artwork of the archives, forbidden to the throngs treading to the Vatican City each year. Only scholars are allowed in, and only to the reading room. The tour has been opened only to small groups of journalists in the past year to promote the book. Van den Heuvel mischievously notes that even thriller writer Dan Brown, whose Angels & Demons likely has brought the archives the most fame, hasn't been given the tour. Between Angels & Demons and a long-running dispute over still-sealed World War II-era records, Vatican officials clearly felt some need to provide a glimpse of the archives, which are seen by church officials as a very serious center of historical research, says Matthew Bunson, author of The Encyclopedia of Catholic History. "What we are seeing is a recognition on the part of the Vatican, or an ongoing discussion at the Vatican, on how to deal with the demands of the modern world for information," Bunson says. "The archives themselves are a fascinating reflection on the durability of the Holy See." After leaving bags behind, visitors follow Flaiani to the staircased Tower of Winds, its white marble steps surrounding a wire-caged elevator and leading to the Leo XIII Study. There, visiting historians peruse the indices to the archive records in a balconied study lined with computers, which has a modern appearance except for its namesake's portrait, looking down from the back wall. "Each index is a key to a part of the archives," Flaiani says, pulling down a binder listing 18th-century letters from papal nuncios, or representatives, from all over Europe. Every kingdom, city or state of note hosted these messengers for centuries, scribbling away at letters and communiqués, and receiving them in reply from the popes. "I will show you something worth seeing," Flaiani says, unlocking and opening a wooden door and leading visitors into a room, walls 30 feet high, frescoed on all sides with scenes of St. Paul's shipwreck in Malta. On the ceiling is a star-hubbed pointer about 3 feet long, surrounded by two circles describing the wind's four directions. On the center of the floor is an eight-pointed rosette inscribed in marble, marked at one point by the spot where, on the spring equinox, a ray of sunlight falls at noon from a small hole in one wall of the windowless room. 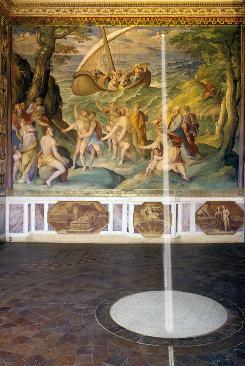 Built by the "pontifical cosmographer" Ignazio Danti, the Meridian Room was intended to record the sun's position along the line dividing the room and for recording the wind's direction, making the Tower of Winds a sort of medieval weather station. From a balcony offering the second-highest vantage in Vatican City, astronomers made observations of the stars. Despite the Catholic Church's history of persecuting the astronomical philosopher Giordano Bruno, who was burned at the stake in 1600, and Galileo, who was condemned by the Inquisition in 1633, the tower built from 1578 to 1580 originally served as an astronomical outpost needed for the reform of the Julian calendar in 1582. A summary of the case against Bruno and complete case against Galileo are held underneath the tower. The tower itself was once the seat of the Vatican Observatory, now at Castel Gandolfo outside Rome. Even on a cloudy day, the view from the tower balcony is spectacular, offering a rarely seen display of Rome's seven hills on the other side of the Tiber river. "Now, we will see the real archives," Flaiani says, tromping visitors down the tower stairs. The tower holds wooden cabinets once kept at Rome's Castel San Angelo, before Napoleon's removal of records in 1810. They contain volumes, some 11 inches thick, filled with the diplomatic correspondence of the Middle Ages. Each set of records resides in cabinets bearing the seal of their particular pope ("How else?" Flaiani asks). •Trial of the Knights of the Templars: parchments from 1308 to 1310 documenting a French king's persecution of the religious order. •The "Bull" of 1493: a paper document splitting the New World, reached by Columbus the year before, between Spain and Portugal. •Napoleon's coronation ceremony: a paper document outlining the ceremony to be used in Paris for the 1804 self-crowning of the upstart French emperor. The bulk of the archives, about 50 miles of shelves, lies beneath more stairs in two basement levels, metal shelf after shelf of documents, thick with the smell of old paper and musty parchment. "The shelves look like any library, but then you see the dates — the 1500s, the 1600s," Van den Huevel says. The basement shelves are closed to everyone but archivists, who bring requested records to scholars upstairs. At stops along the shelves, Flaiani displays famed documents — a papal bull excommunicating Martin Luther in 1521 — and amusing ones — the 1770 paper conferring the Order of the Golden Spur upon the 14-year-old musical prodigy Mozart. The archives are akin to the U.S. National Archives, Flaiani says. They are more secretarial than truly "secret" and do not hold records related to sexual abuse scandals rocking the church. But they are surrounded with their own controversy over what they might show about the Church's diplomatic conduct in World War II, and whether Pope Pius XII did too little to protest the Holocaust. Debate has been raging since an International Catholic-Jewish Historical Commission suspended its activities in 2000 after requests by panel members for unrestricted access to the archives were turned down. The restricted records, those from the 1939 accession of Pope Pius XII forward, rest on fenced shelves at the back of one basement level. Flaiani says an index to those records will be completed by 2014, after which the current pope would have to decide to make them available. Popes generally make records available 70 years after the death of a predecessor, according to historian William Patch of Washington and Lee University in Lexington, Va., writing in the current edition of The Journal of Modern History. The Vatican Secret Archives does display a 1934 letter from Pius XI to Hitler hoping for better relations between church and state. "The controversy over the political role of the Catholic Church in this era will, of course, not be resolved even when the Vatican archives become fully accessible," Patch writes. "Historical scholarship offers no method for resolving the debate between those who believe that Pius XII was cowardly not to have risked more to help the Jews and those who believe that he, as pope, would have been irresponsible to have done so." Even Flaiani gets lost amid the endless basement shelves, taking his tour on a circular path before finding his way to the exit. He bids visitors farewell from within the metal doors of the archive. "The archivists take what they do very seriously; they come at their work from a serious academic perspective. They won't be rushed by the outside world's demands for instant information," Bunson says. "As history, the archives will always be fascinating. 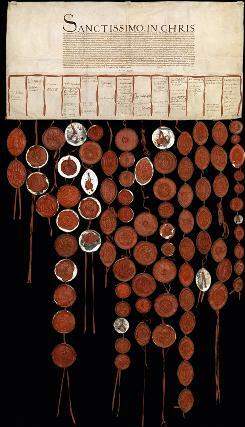 Here we have diplomatic records stretching from dealings with everyone from the Mongols to Hitler. It's interesting for what it says about Vatican culture that they have chosen this for display." 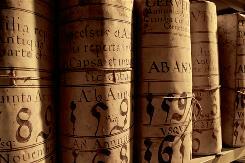 At the Vatican Secret Archives, "the shelves look like any library," but, says Belgian publisher Paul Van den Heuvel, "then you see the dates." Henry VIII's "Great Matter" and the letter of the Peers of England to Clement VII found in the Vatican Secret Archives.